Pamelamas LLC: Pamelamas LLC in the news! Home Pamelamas LLC: Pamelamas LLC in the news! 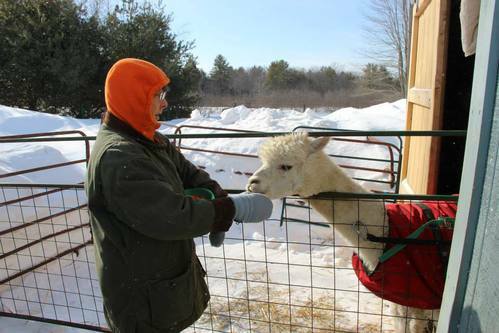 Arundel - Pamela Drew has kept alpacas for nearly 15 years, but it's only recently that she joined the Kennebunk-Kennebunkport-Arundel Chamber of Commerce. Now retired from Kennebunk Savings after 37 years, she is focusing on the product sales end of her alpaca farm at 233 Limerick Road in Arundel. She sells hats, gloves, socks, blankets and more from co-ops, fiber pools ad commercial suppliers, along with a limited selection of hand-knit and hand-woven products, both online and from her home-based shop. 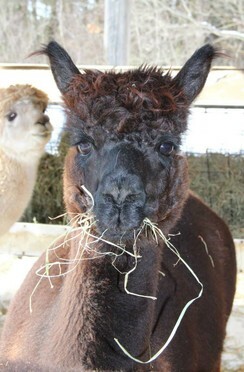 "It's a cold weather product," says Pamela, noting alpaca fiber is warmer than wool. "Plus it's lightweight so you get the warmth without being too bulked up." With 23 alpacas-12 girls in one pen, 11 boys in another-Drew shears them once a year and sends their fiber to multiple places. She is a member of The New England Alpaca Fiber Pool, Alpaca Fiber Co-op of North America, and Natural Fiber Producers, and they all produce finished products from the fiber collected. Some fiber also goes to a mini-mill in Maine and is processed into yarn. Drew is a regular at the Saco River Winter Market and participates in Open Farm Day every July. She has also regularly participated in Arundel Heritage Day and Punkinfiddle at Laudholm Farm in September, and Kennebunk Harvestfest and York Harvestfest in October. Right now she has no set hours in her farm store, but will be setting hours to be open for the summer season. Right now "If I'm here, I'm here" she said from her shop. She is also available by appointment. 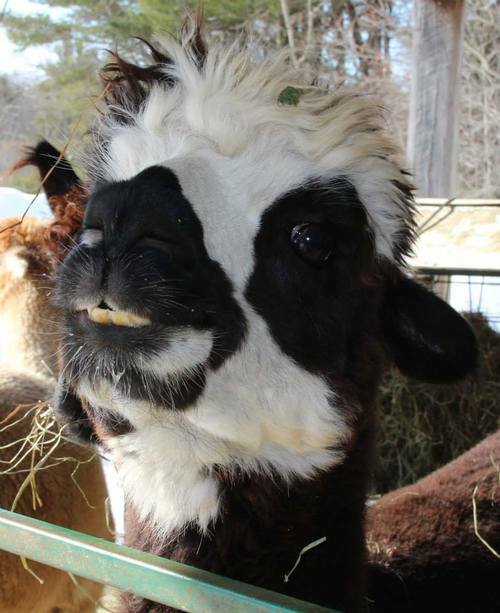 So why the name Pamelamas when she only has alpacas, a cousin of the llama? 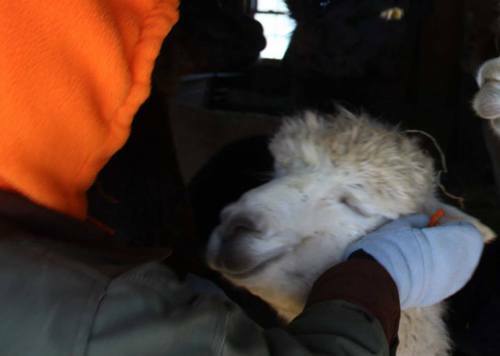 "Pamepacas just didn't sound right," explaining the playful name still works because alpacas are members of the camelid family, in the genus lama, which includes four species - alpacas, llamas, vicunas, and guanacos. In better weather - the snow is still too deep in the field - the male animals can be seen from the road, grazing in the fields. Drew invites passersby to stop by the farm for a visit. 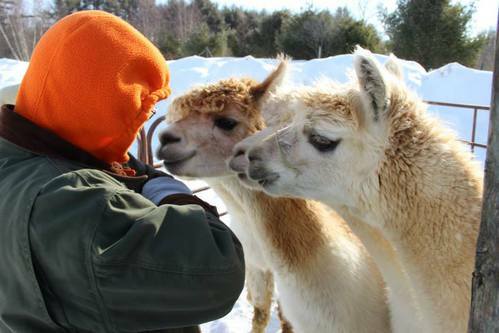 "They're not really huggable, they're not really animals that want to be handled, but kids love to stop by and feed them carrots," she said. But to Drew, they are all her favorites. "We're very attached to all of them," she said, noting Chip, a 17-year-old male, holds a soft spot in her heart. "Everybody has a personality." Pamelamas is open by chance and by appointment. For information, call 468-4690 or visit www.pamelamas.com.